An informative guide to market microstructure and trading strategies Over the last decade, the financial landscape has undergone a significant transformation, shaped by the forces of technology, globalization, and market innovations to name a few. In order to operate effectively in today's markets, you need more than just the motivation to succeed, you need a firm understanding of how modern financial markets work and what professional trading is really about. Dr. Anatoly Schmidt, who has worked in the financial industry since 1997, and teaches in the Financial Engineering program of Stevens Institute of Technology, puts these topics in perspective with his new book. 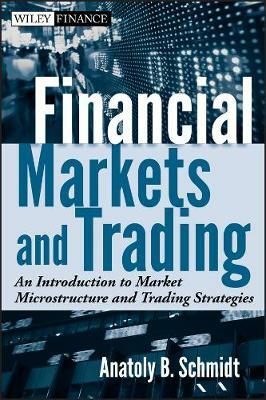 Divided into three comprehensive parts, this reliable resource offers a balance between the theoretical aspects of market microstructure and trading strategies that may be more relevant for practitioners. Along the way, it skillfully provides an informative overview of modern financial markets as well as an engaging assessment of the methods used in deriving and back-testing trading strategies. * Details the modern financial markets for equities, foreign exchange, and fixed income * Addresses the basics of market dynamics, including statistical distributions and volatility of returns * Offers a summary of approaches used in technical analysis and statistical arbitrage as well as a more detailed description of trading performance criteria and back-testing strategies * Includes two appendices that support the main material in the book If you're unprepared to enter today's markets you will underperform. But with Financial Markets and Trading as your guide, you'll quickly discover what it takes to make it in this competitive field.